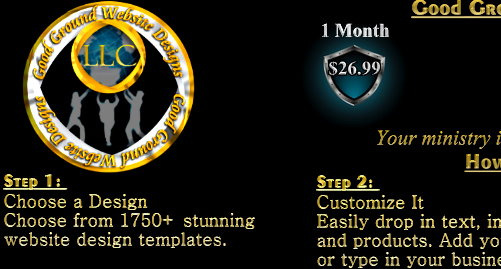 Over $1000 worth of features are included free with GoodGroundWebsites. A sampling of 30 sample websites you can see built with GoodGroundWebsites. 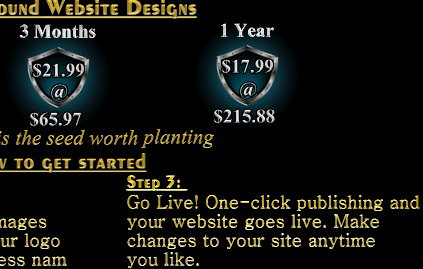 Top 10 reasons GoodGroundWebsites users give for choosing GoodGroundWebsites. With 500 products and lots of options, GoodGroundWebsites shopping cart delivers. Choose one of the Builder's Payment Options. WebMaster"I have spent 3 evenings checking out web builders. Yours is the top of the line. It is concise and clear, I love the bordered text, etc. Thanks again and i am anxious to get on with it. Thanx again. Rich.